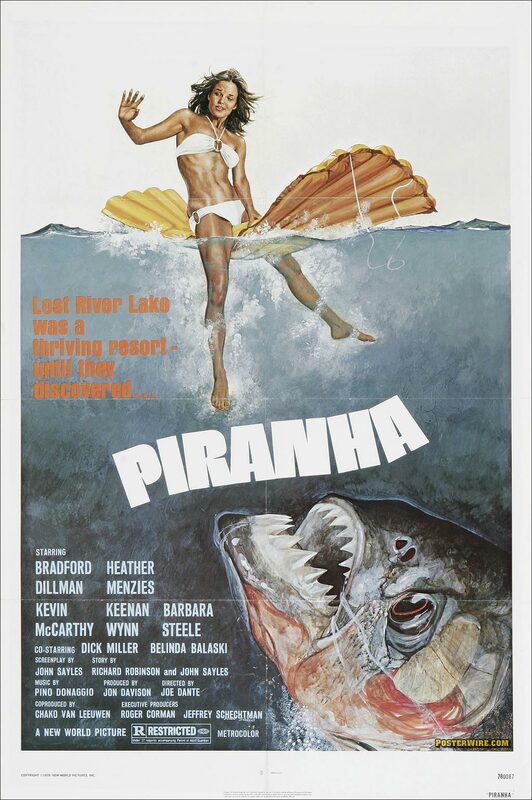 The Piranha movie poster also follows the Jaws poster formula: swimming beauty on the water, in danger from said creature (with large teeth) from below. The Piranha poster illustration does invoke the right look — another example of how exploitation poster artwork was the great equalizer when compared to the advertising of big budget counterparts. After all, hiring a good illustrator wasn’t beyond the expense of lower budget films. If they gave me as much of a free hand as possible to do the work, I didn’t care whether I was working for a B-movie company or a major. At New World, I’d go to lunch with the art director, he’d tell me the story of the movie, I’d make a drawing on a napkin, he’d approve it and I’d go home and do it. I never saw any of the movies, but I made the movie ads and they made a lot of money! Fixed a broken link for the supersize HQ image of the Piranha movie poster. What’s up with the grammatical errors lately? A whole bunch of “it’s” instead of “its”, and then “hiring an good illustrator” instead of “hiring a good illustrator”!? Come on, I love this site! Don’t let bad editing ruin it for me!